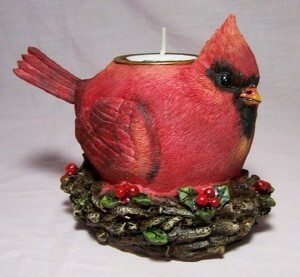 This cardinal candle holder is very pretty. Nestled on a nest of twigs decorated with holly & berries it stands 4-1/2" tall and is 6" wide. This bird candle holder is from tii collections. It feels like it's made of cold cast ceramic but I can't say for sure.